needed to pull back, and did not feel that they were able to do what they had originally agreed to. parts of your life are suffering, taking a step back is the best plan for the time being. However there are ways to work smarter, and get everything accomplished. Even before I learned about the Law of Attraction, I knew the value of looking within. Through intensive studies and coaching certification programs, I learned how to change that state of consciousness, being overwhelmed. And, I have helped many others achieve what was needed to shift to a better feeling, to stay focused and move into action and create success. Law of Attraction teaches us that what we think will manifest, regardless of being positive or negative. So, if we are feeling there is ‘too much on our plate, not enough time, it’s too hard’, we will certainly get more of what we are asking for — even if that is not what we think we are asking for. 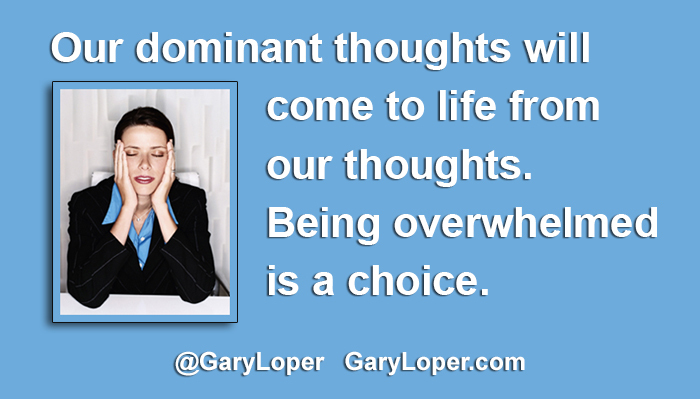 Our dominant thoughts will come to life from our thoughts. Being overwhelmed is a choice of how we are investing our energies. One of the biggest lessons I learned from several teachers in slightly different words was: “you cannot grow in your comfort zone”. We need chaos to help us see which way we want to go. If you are feeling overwhelmed, a Strategy Session will help you with the one thing that can change today to improve you or your business. You may be interested in reading my blog, EATING ELEPHANTS #JustForToday. By shifting your thought to a bite at a time and enjoying the process, you will see yourself making significant progress instead of getting stuck and stopping.